Grandma's Blackberry Cobbler - Home. Made. Interest. My Grandma’s Blackberry Cobbler recipe is a family favorite. It’s an easy blackberry cobbler made with fresh blackberries and a baking powder biscuit dough that bake together into a sweet, juicy dessert you don’t want to miss. My Grandma’s Blackberry Cobbler is one of my favorite childhood memories. I was lucky enough to grow up with a grandma that had a huge garden in her back yard and made everything from scratch. In the summer every meal was accompanied by fresh sliced tomatoes and, if you were lucky, dessert was her homemade blackberry cobbler, made with blackberries picked from the garden that morning. It was one of my favorite parts of summer visits to Grandma’s house. The most important part of the blackberry cobbler recipe, other than the blackberries of course, is grandma’s baking powder biscuit recipe. This is used to make the top layer of the cobbler. Now, my grandma liked her crust to be thin, so she rolled it out almost like a pie crust to make the top of her blackberry cobbler. 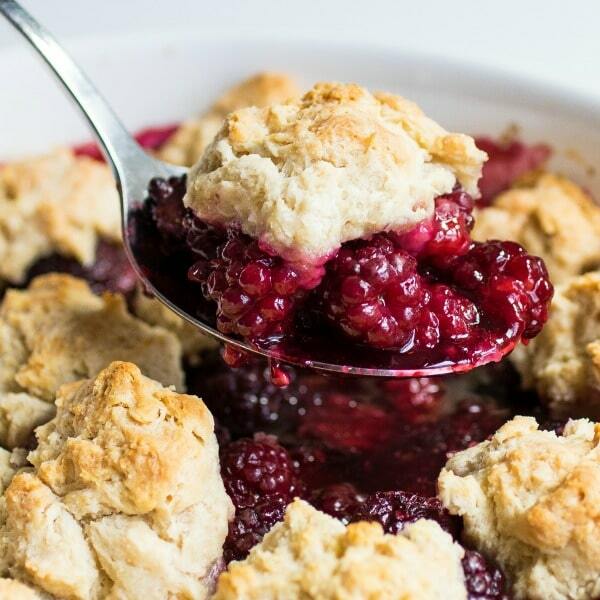 I opted to drop the baking powder biscuit dough into the blackberry cobbler instead because I love a lot of crust and when those fluffy balls of biscuit dough bake in the cobbler they soak up all of that blackberry juice and….OMG, it’s amazing! Toss your blackberries in sugar and cornstarch. Place them in a greased casserole dish and top with a few pats of butter. Drop your baking powder biscuit dough in small amounts all over the top of the blackberry cobbler. Bake at 350 degrees F for 35-45 minutes, or until biscuit dough begins to brown and the blackberry mixture is bubbling. 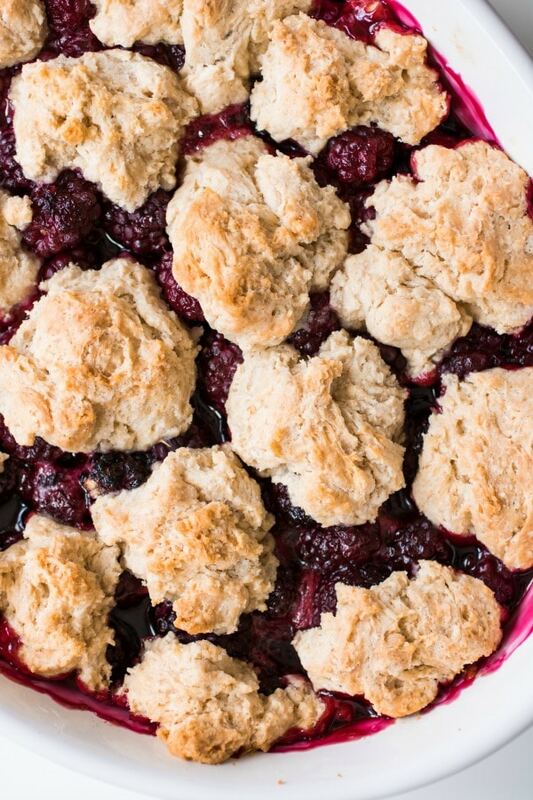 You can use fresh or frozen blackberries to make this easy blackberry cobbler. If you choose to use frozen just defrost them and drain off any excess liquid before using. Like all berries some blackberries are sweeter than others. Make sure to taste the sugared blackberry mixture and add more sugar as needed before putting them in the cobbler. This is a cobbler not a pie, it’s going to be juicy, and runny. Don’t fight it :). Those delicious biscuits are going to be swimming in a sea of blackberries and blackberry juice. Scoop it all up and put it in a bowl along with a scoop of ice cream and enjoy! Want more southern dessert recipes? 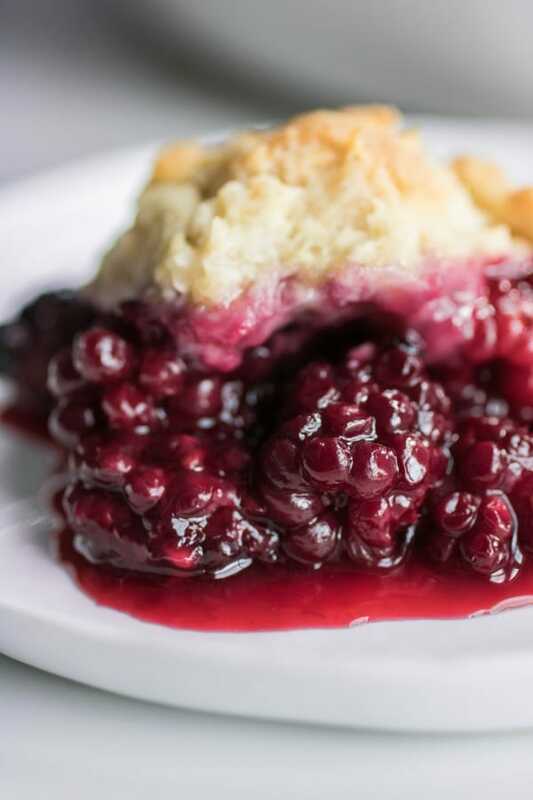 Every bite of this easy blackberry cobbler reminds me of Grandma and sitting at her kitchen table while she rolled out her biscuit dough, and my sister and I ate fresh blackberries dipped in sugar. I hope you guys like it as much as I do! Like this recipe? Pin it to your Dessert Recipe board! My Grandma's Blackberry Cobbler recipe is a family favorite. 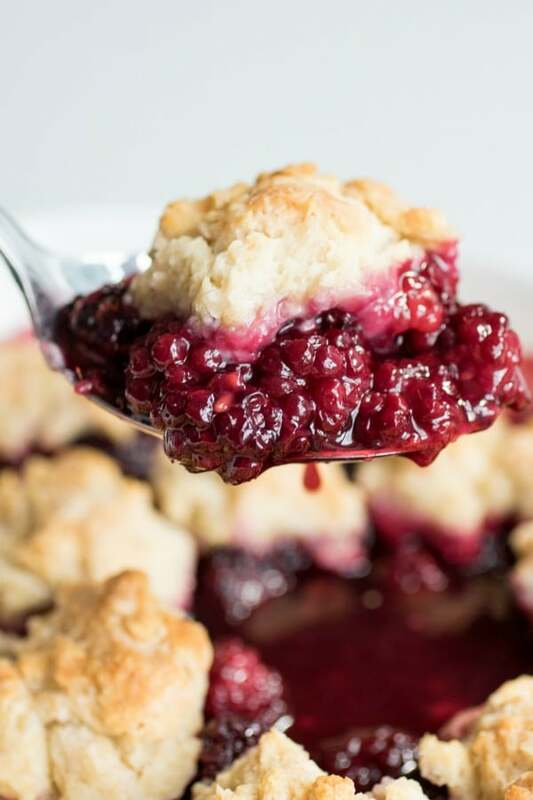 It's an easy blackberry cobbler made with fresh blackberries and a baking powder biscuit dough that bake together into a sweet, juicy dessert you don't want to miss. 6 cups Blackberries , about 30 oz. Sift the dry ingredients together and cut in the shortening until all ingredients are well mixed. Add milk, stirring until all flour is moistened. Work the dough for about 20 seconds. Place the dough in a bowl until ready to use. Wash blackberries and pat dry. Toss blackberries with lemon juice and then add sugar tossing until they are well coated. Place berries in a greased 11"x7" casserole dish. Cut 2 tbsp of butter and distribute over the top of the berries. 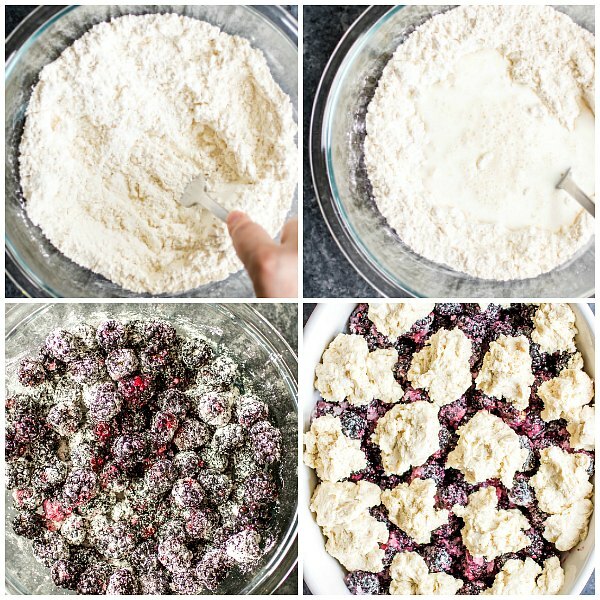 Drop the biscuit dough into the blackberry mixture in 2 tablespoon portions (this doesn’t have to be exact but don’t use too much more dough for each drop biscuit or it will take longer to bake. Cover the top of the cobbler with some berries peeking through. Bake in 350 degrees F. oven for 30 minutes. Melt the remaining 2 tablespoons of butter and in the last 10 minutes of baking brush it over the biscuit tops to help them brown. Continue baking 10-15 minutes or until mixture is bubbling and biscuit dough is golden brown. « Previous PostMango Chicken Salad for a Fiesta! Oh, now this looks amazing. Love the juices running into the ice cream too….super yum yum yum!!! Thanks so much for linking up to Teach Me Tuesday last week! You are very much appreciated! Hope to see you again tonight! Fruity desserts are my favorite, love the look of this! This dish looks so good and just in time for berry season! My mother-in-law makes a similar version but she bakes the berries until they are hot and then pulls it out of the oven and drops on the biscuit dough and then finishes it. Cobler season is going to be soon in our home once the berries start coming in. Can’t wait to try this soon. Love the pretty color. Yum! Those baking powder biscuits sound phenomenal! Recipes from grandma are always so special, and yours looks incredible! Bring on berry season! Oooh girl, this is amazing. Those juicy blackberries are calling my name – I just love a fruit cobbler like this, and your biscuit recipe is to die for! A perfect summer dessert. I want to bring it to every BBQ! Blackberry cobbler is one of my favorites, and, as luck would have it, I have blackberries waiting in my refrigerator to be transformed into something, so I think I will give your cobbler a try. I enjoyed reading about your grandmother’s garden, and berry vines. As a child, my mom would make blackberry cobbler if I would pick the berries, so your post brought back memories for me, too. This cobbler looks absolutely amazing! Food that has such strong, lovely memories tied to it is always the best! Thank you for sharing your grandmother’s recipe! Love how easy and quick this is to make. Perfect for springtime and sharing all year long. Beautiful pics and mouthwatering recipe! That crust looks awesome! My mama makes a cobbler with dough balls that is to die for, so a topping like that is right up my alley! 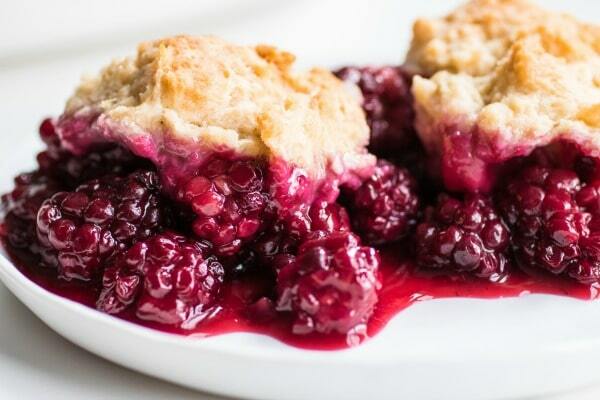 Love a good cobbler and blackberries make this perfect for summer! This is definitely going on my “to make” list.